The Zombification of the Financial System: Debt is NOT a Free Lunch, Debt is NOT Wealth! So says John Aziz (http://azizonomics.com) in edited excerpts from his original article*. Why are both debtors and creditors willing to build a status quo of massive unprecedented debt? From the side of the debtors…it is that debt is easy. Why work for your consumption when instead you can take out a home equity loan, put the purchase on a credit card or lease what you want? [Unfortunately,] where once deflation often made debts unrepayable, and resulted in mass defaults, liquidation and structural transformation, today — thanks to money printing — debtors get their easy lunch of cheap debt, and creditors get their pound of flesh, albeit devalued by the inflation of the monetary base. It has been a superficially good compromise for both creditors and debtors. Everyone has got some of what they want – but is it sustainable? The endless post-Keynesian outgrowth of debt suggests not. The above figures are staggering; the advanced nations typically have between three and ten times as much total debt as they have economic activity. In the United Kingdom — the worst example — if one year’s economic activity was devoted entirely to paying down debt (impossible — people need to eat and drink and pay rent, and of course the United Kingdom continues to add debt) it would take ten years for the debt to be wiped clean. a) From the side of the creditors, I think the answer is the misconception that debt is wealth. Debt can be used as collateral, or can be securitised and traded on exchanges (which itself can become a form of shadow intermediation, allowing for a form banking outside the accepted regulatory norms). To keep the value of debt high, and thus keep the debt illusion rolling along (treasury yields keep falling) central banks have been willing to swap out bad debt for good money – but debt is not wealth; it is just a promise, and in today’s world carries huge counter-party risk. Until you convert your debt-based promissory assets into real-world tangible assets they are not wealth. b) From the side of the debtors, I think the answer is that debt is easy. Why work for your consumption when instead you can take out a home equity loan or get a credit card? Why buy the one car that you can afford when instead you can buy two with debt? c) There is another side in this world: the side of the central planners. Since the time of Keynes and Fisher there has been an economic revolution: deflation has effectively been abolished by central banking – and so we get to where we are today: the huge and historically unprecedented outgrowth of debt. 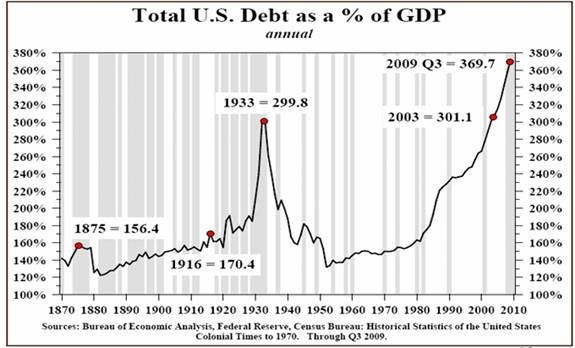 Deleveraging necessitates economic contraction, which produces the old Keynesian-Fisherian bugbear of debt-deflation, which the central planners abhor and so they print. Where once deflation often made debts unrepayable, and resulted in mass defaults, liquidation and structural transformation, today — thanks to money printing — debtors get their easy lunch of cheap debt, and creditors get their pound of flesh, albeit devalued by the inflation of the monetary base. It has been a superficially good compromise for both creditors and debtors. Everyone has got some of what they want – but is it sustainable? The endless post-Keynesian outgrowth of debt suggests not. In fact, what is ultimately suggested is that the abolition of small-scale deflationary liquidations has just primed the system for a much, much larger liquidation later on. Bad companies, business models and practices that might otherwise not have survived under previous economic systems today live thanks to bailouts and money-printing. This moral hazard has grown legs and evolved into a kind of systemic hazard. Unhealthy levels of leverage and interconnection that once might have necessitated failure… flourish today under this new regime and its role as counter-party-of-last-resort. With every rogue-trader, every derivatives or shadow banking blowup, every Corzine, every Adoboli, every Iksil, comes more confirmation that the entire financial system is being zombified as foolish and dangerous practices are saved and sanctified by bailouts. With every zombie blowup comes the necessity of more money-printing, and with more money-printing to save broken industries seems to come more moral hazard and zombification. Is that sustainable? Worse, in the modern financial world, we see an unprecedented level of interconnection. The impending Euro-implosion will have ramifications to everyone with exposure to it, and everyone with exposure to those with exposure to it. Not only will the inflation-averse Europeans have to print up a huge quantity of new money to bail out their financial system (the European financial system is roughly three times the size of the American one bailed out in 2008), but should they fail to do so central banks around the globe will have to print huge quantities of money to bail out systemically-important financial institutions with exposure to falling masonry. This is shaping up to be a true test of their prowess in hiding monetary inflation, and a true test of the “wisdom” behind endless-monetary-growth fiat economics. Central bankers have shirked the historical growth cycle consisting both of periods of growth and expansion, as well as periods of contraction and liquidation. They have certainly had a good run. 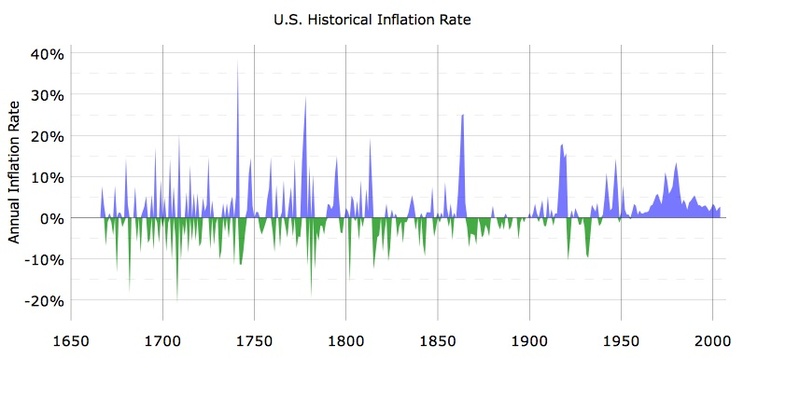 Those warning of impending hyperinflation following 2008 were proven wrong; deflationary forces offset the inflationary impact of bailouts and monetary expansion, even as food prices hit records, and revolutions spread throughout emerging markets. Japan — the prototypical unliquidated zombie economy — has been stuck in a depressive rut for most of the last twenty years. These interventions, it seems, have pernicious negative side-effects. The twin delusions central bankers have sought to cater to — for creditors, that debt is wealth and should never be liquidated, and for debtors that debt is an easy or free lunch — have been smashed by the juggernaut of history many times before. While we cannot know exactly when, or exactly how — and in spite of the best efforts of central bankers — I think they will soon be smashed again. 2. True Money Supply Is Already Hyperinflationary! What’s Next? 10. Will This Be The USA in 2012? Previous Has Gold Spiked Due to a "Flight to Quality" or Increased Inflation Expectations? Next Does Gold's "purchasing-power-protection" Price History Suggest Gold is Over-priced?